Reference files other than academic articles are those files that I do not import in Papers. It may be simply because their file types are not compatible with Papers (Papers works best with pdf files whereas I often come across .doc, html, txt, xls and various image files). It may also be because these files are not really articles: they may be notes, emails, maps, charts, diagrams, data tables, draft manuscripts etc. Finally they may actually be articles but not of the type I would like to load in my Papers library (e.g. on subjects I am not really interested in and want to keep them “just in case”). Such files can be filed by simply dragging them to Leap’s sorter. You can also tag them at the same time. 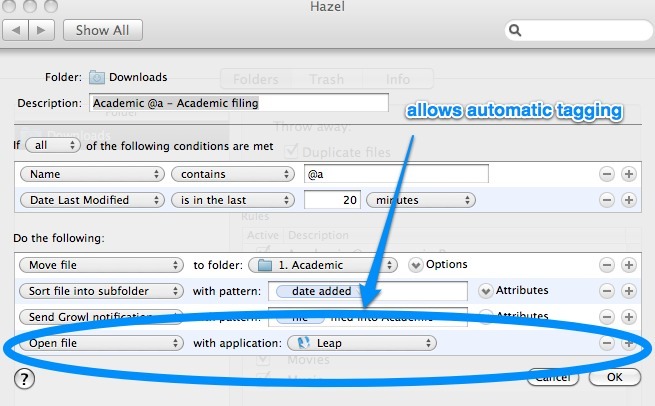 Emails, MacJournal entries and lots of other things can be dragged to Leap and will become properly filed (and tagged if you want) files. In order to save time you can actually duplicate the Downloads rule and then drag it to the Materials and Data (or whatever the name of your reference folder is) folder rules. This entry was posted in Files, Writing and tagged Hazel. Bookmark the permalink.